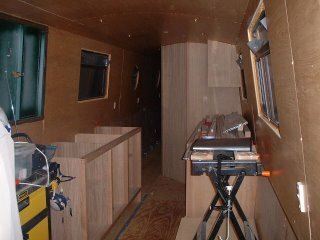 Today Sue and I paid a visit to view our baby taking shape. On a very cold december morning we travelled to Berkhamptead via the Hemel trading estate, site of the recent oil depot fire. This route was taken owing to jct 8 being closed on the M1. The extent of the blast was very much evident even on the outside edge of the estate that traffic was restricted to. 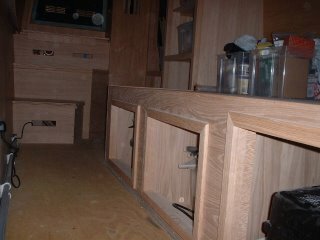 Well as you can see in the pics we now have kitchen worktops with hole cut for sink and doors on units and drawers fitted. 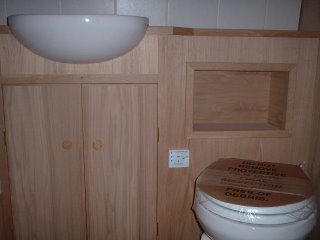 The bathroom is tiled, sink and vac flush loo installed. The small bath also acts as shower tray. In the sleeping area at the stern we have w`robe door fitted and drawers fitted. 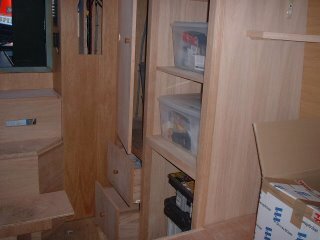 Just a door to be fitted on the storage unit between the bed & w`robe. 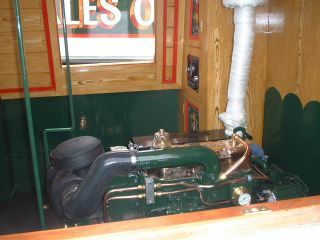 The 3kw sterling inverter lives behind the rear steps and is working fine. When we arrived Phil our builder was in the process of installing the Mikuni diesel boiler for the central heating. 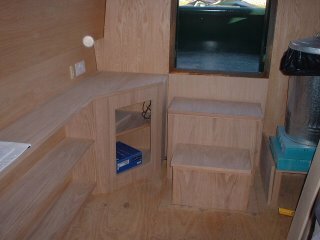 At the bow end the corner unit and bookshelves are in and on the starboard side the plinth for the s/fuel stove is fitted and the tiles chosen by us are ready to fix. 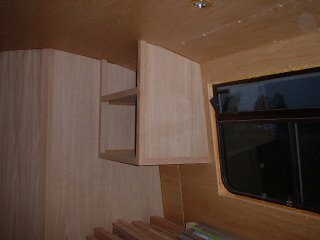 The plinth below stove has been made big enough to allow a slim door that will give access to storage for coal. Saves going out in cold to often. 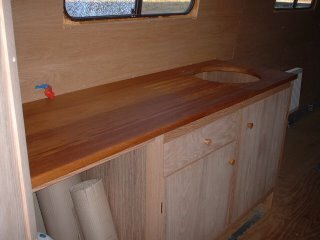 Pinched this idea from someones build site so full credit to whoever you are.Will post pics as soon as the stove is installed. doubt happier than i have been for man y years. 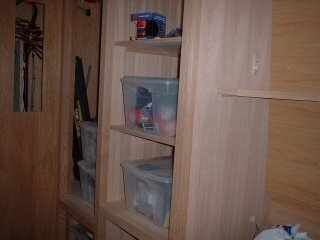 Anyway while out and about we came across a chap who fits out 3 boats per year and had just finished one(pic on right) He has just started a new boat with a slightly different layout. The boats are Semi-Trad 58` s/steel tank, w/machine, microwave 712ah domestic battery bank oak floor throughout in fact just what we both are looking for. Will reveal more on next blog and as my solicitors are just about to exchange contracts on the houes everything is looking great. Have just re-turned from a visit to Preston Brook show and am now in an even more confused state of mind. I went for the purpose of viewing the part fitted Liverpool Boats. 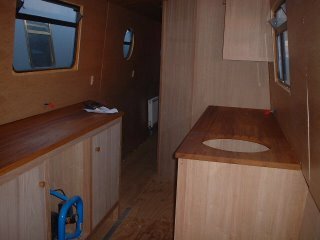 This has the kitchen & bathroom fitted and working and with extras fitted ie diesel c/heating and an inverter works out about 42k. This would leave me to fit bed box, wardrobe, tv unit in saloon, box in caloriefer, light fittings (wiring tails in place), horn, h`light and flooring throughout plus any other bits i have missed. 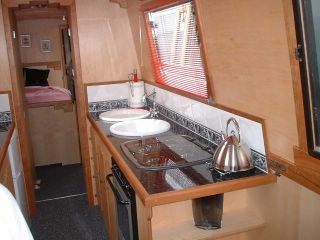 Now the price of fully fitted on this boat inc my extras comes to about 51k. A difference of 10k. I have no doubt i can fit from the part fit supplied for less than 10k, so am now thinking this over. 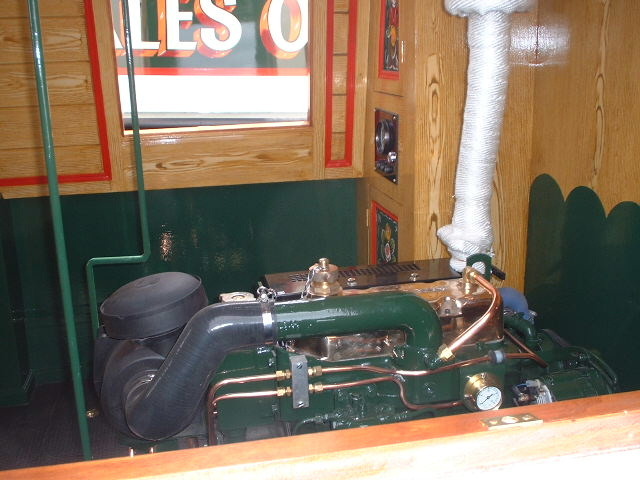 But at the show i came across Calder Valley dragonfly and was quoted about 52/53k for my spec ie same as L`pool boat fully fitted. The thing is the Calder boat was in my opinion far better quality fit out than the L`pool boat. 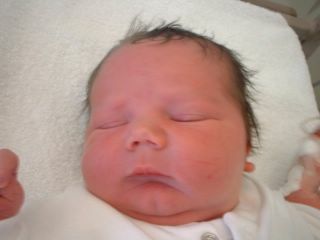 So now do i go l`pool and save some cash or calder and not worry about fitting out. Or keep looking for a decent used boat although what i have seen so far for 40-45k are not very good considering the difference in price compared to new, also bearing in mind with new i would not have the worry of something going wrong soon after purchase as i would s/hand. 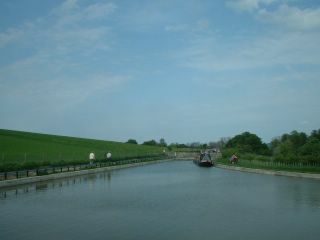 Oh well just have to chat some of you boaters on my towpath visits and get some views. 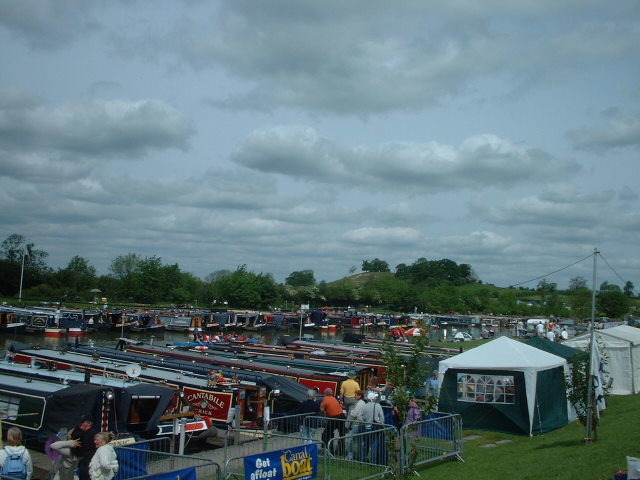 While waiting for the legal people to dot the i`s and cross the t`s to complete my house sale(only 3 in the chain) i paid a w`end visit to Whilton Marina in Northants. As i went fom jetty to jetty, boat to boat not enjoying the experience as nothing took my fancy a sailaway caught my eye. 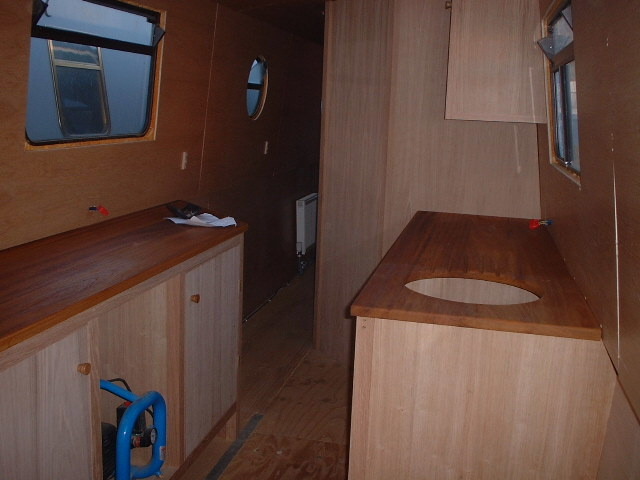 This was lined with c/heating,wiring and plumbing fitted and painted. This set me thinking would this be the way to go as i am not at all worried about fitting out my-self. Anyway further web searching brought up Liverpool Boats are producing a part fitted narrowboat wich has the kitchen and bathroom ready to use. So now i am doing my homework re pricing up all sorts of things to see if this could be an option for me. 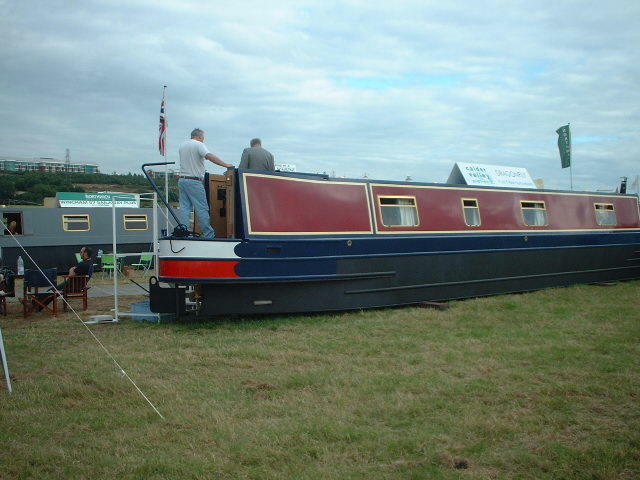 First figures--early days yet-- show i could start life on the water with a brand new boat at a far reduced price in fact the same price as the used boats i viewed at Whilton. I will report my final figures soon. Recently met up with Sue & Vic on N.B. NO PROBLEM at Bedford(link to blog on left) Had a very nice chat for an hour or so, although it only seemed like 5mins as they were such good company. Many thanks to you both And to lucy for allowing me to board. Have ordered all available first mate guides sue. 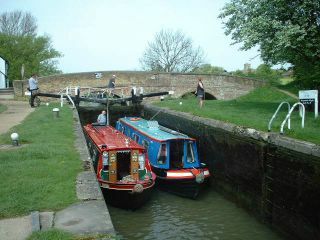 The guides can be found at WWW.CANALMATE.CO.UK for anyone like myself ignorant of the mountains of information out there. The house saga drags on. I am the top of the chain and am sorted, but the bottom end is dragging it`s feet so patience is the name of the game. 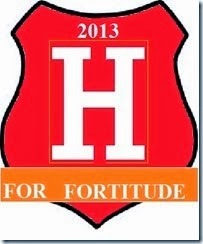 Anyone who has not read the NO PROBLEM blog please use the link you won`t regret it. It gave me the inspiration to start my blog. After 3 months on the market have had an offer VERY close to asking price and have accepted. 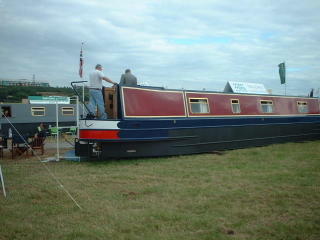 Also have arranged to look at a boat at LEE NARROWBOATS that is arriving from Morroco next month. 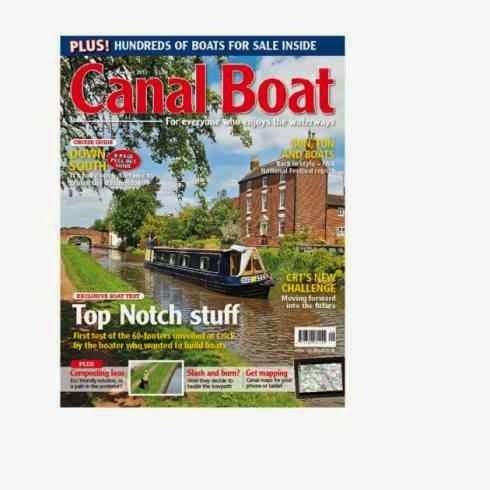 Have not decided on a builder yet but thought it might be interesting to see this boat if only to see what is available in all price ranges. Have also been looking at 2yr old boats so i am not sure what way to go at the moment but i suppose you must taste all the sweets before you decide your favourite. Anyway i feel like i am cruising through Blisworth tunnel and the light at the end is getting brighter. I hope all boaters reading my blog are safe and well see you all soon. Spent 2 days at crick and i might just have missed a few stands, certainly saw all the boats on show. It truly was a well organised show, plenty of parking, room to walk site to site, the most luxurious mobile toilets i have ever seen and when the show closed music in the marque till late. A good aerobatic display each day by the wing walkers was a good excuse to plonk down on the grass and relax. Have made a note of 3 builders that willbe my first ports of call for a quote when the house is sold, and do you know each one had views about the type of loo! Funny at home you don`t give it a second thought, do it and flush it, and don`t give it a second thought. 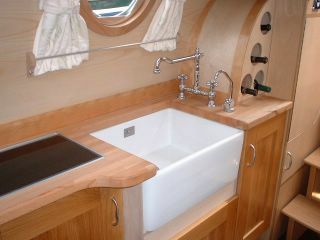 Stainless steele water tank is a must, don`t fancy treating the inside of integral one sounds a pain. 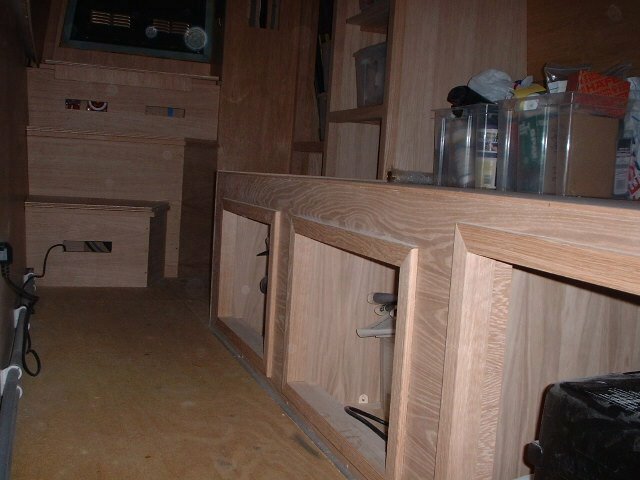 So many things have come to light by just walking through the boats standing in the kitchen, sorry galley, and checking out the bathroom for elbow room, must have looked a sight standing by the wash basin pretending to wash, hope not to many people saw me. Anyway it was well worth the trip much was learnt and some wonderful conversation was enjoyed with people i had not met before. Will post a few pics, enjoy. Seem to have got on the wrong side of the cut with TERRY (ref. comments on last blog-politics).Terry says in his 17yrs on canals he has never heard the term "locking" i had at the time and being new to canals no reason to doubt him. Untill by chance looking at website WWW.RONAROSA.CO.UK click on 2004 pictures 5th line down 3rd thumbnail the caption reads "locking through". Has anyone else heard of "locking". Also thanks go to KIMBERLEY for her comments on my last blog. I welcome ALL comments good or bad. Yes Kimberley, who wants to think about politics on the cut. This is one of a few reasons i want to change my way of life. The house market seems to be slow at the moment so i am having to accept that it may be sometime before i move on to my new life, but i will get there and look forward to meeting you all including Terry, the pint offer still stands. Walking by canals Terry is my way of relaxing after a hard weeks work, so don`t knock someones way of life because it is not your way. Live and let live. Anyway i intend to leave all this , well most of it, behind when i step aboard my new world. My biggest worry will be where shall i go now and where is the next pumpout. If my local council want to spend £500.000 yes 500K of ratepayers money for a towncentre bus type shelter with soft padding for the drunks to use only to find it un-used after a few months then in future it won`t be my money. I will invest my money and it will be my decision to spend it as and when I decide. Yes i do realise there are bandits on parts of the cut, but in the world i live in now that`s nothing to what goes on day after day all round me. The cut is a new world. Walked round to the shops recently nothing happened. Walked around marsworth on Grand Union along towpath and within 20 steps people were saying good morning, just sat on a lock resting and chap on boat struck up a conversation first, good morning was followed by am i walking or locking for a boat. Why is it so different. Anyway i am not going to worry why it`s different i want to join the club. House sale up-date is no sale yet. Well must go now have to decide where to walk on sunday. Thinking of going to Soulbry 3 locks on the G.U. Well it`s been 3 weeks and 5 days since the house went on the market. So far had 2 viewings but no offers so its carry on as usual being part of the rat race. Somehow it seems to be easier, but this is only because i can see a light at the end of the tunnel. I know that i will be in the not to distant future be out there among you boaters, so for now i will just keep my head down and read boaters blogs and take in as much info as i can via the many web sites. Also the crick show is fast approaching. 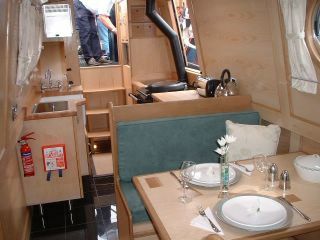 Will need 2 days there so i can see all boats etc. Just can`t keep away from the cut, think it`s starting to flow in my veins. Easter saturday spent a day out and about. 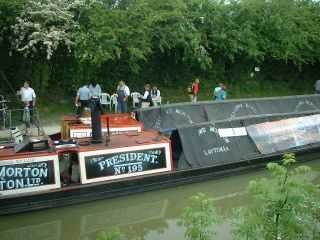 First went up to stowe marine at wheedon had a chat but i feel they are a little expensive. 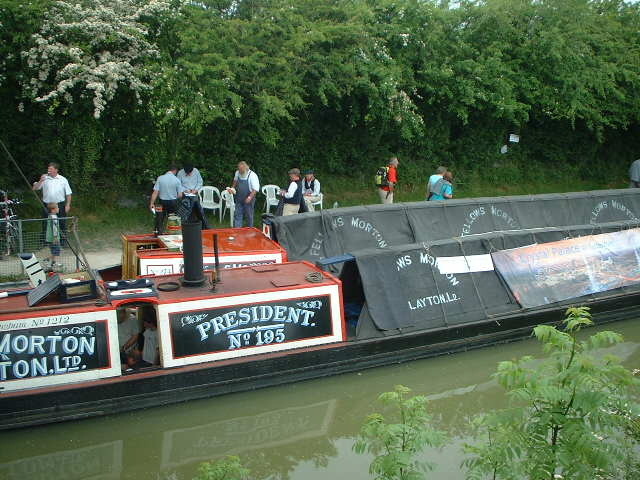 Next called in at Blisworth and had a nice walk along the towpath and sat watching my dreams float by.....soon....won`t be long. Finished up at Stoke Breune and spent a happy hour talking to crews on at least 6 boats, what a freindly bunch you boaters are. 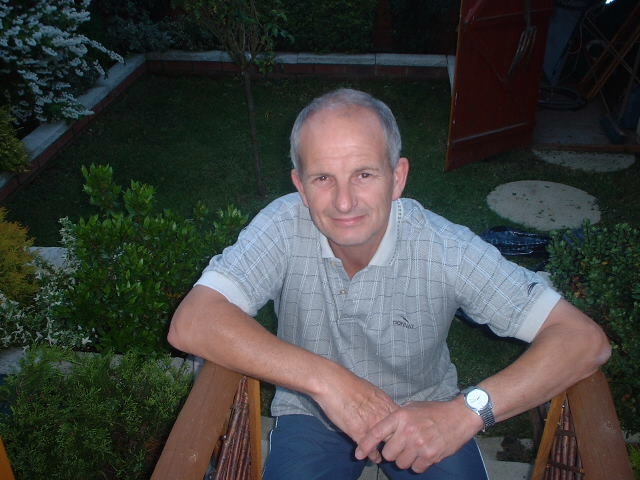 Many thanks to those of you who have posted comments but hey have you a blog site i would love to look you up. Had my first house viewing tuesday, hope this might mean i am getting nearer to the cut. Well today i have put the house on the market. All being well i will be in a good position to do a deal at the crick boatshow. 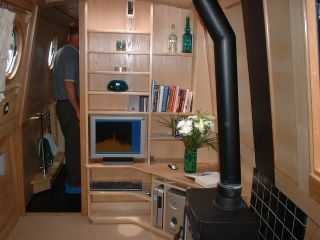 The idea is to sell the house and get a boat design that i can put to a couple of boat builders for a quote. The most difficult decision will be what to install by way of inverter battery pack in fact at the moment electrics are my biggest headache. I have to bear in mind that although i will be on a permanent cruise for 9/10 months of the year there will be times i will moor for perhaps 3 days or a week. Lots to think about. Have decided a change of lifestyle is neede if only to save my sanity. As i am now on my own after losing my wife to cancer i found that the thought of spending the rest of my working life as the last 20yrs rushing a-b very depressing. 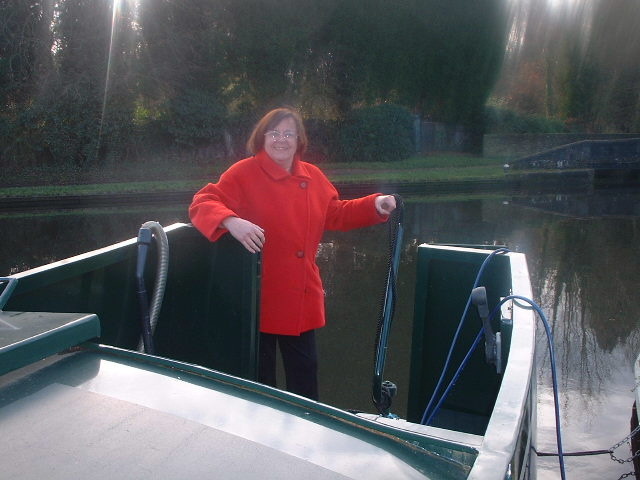 How i chose narrowboat life i can`t exactly remember. Anyway have spent hours surfing the web getting as much info as possible. Lots of un-answered questions but will i am sure find some of them at CRICK SHOW end of may. 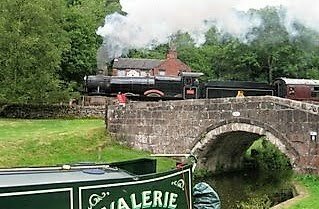 What i intend to do on my blog is create a diary of events leading upto the launch of the narrowboat "VALERIE". 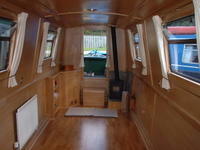 I will include details of selling the house ordering the boat etc. After i begin my adventure i will update on a daily basis as i cruise.